Apparently lots of people are using Vagrant these days, so I figured I’d try it out. I wanted to get it working on Fedora, and without Virtualbox. This is an intro article on Vagrant, and what I’ve done. I did this on Fedora 19. Feel free to suggest improvements. Vagrant is a tool that easily provisions virtual machines, and then kicks off a configuration management deployment like Puppet. It’s often used for development. I’m planning on using it to test some Puppet-Gluster managed GlusterFS clusters. You should already have the base libvirt/QEMU packages already installed (if they’re not already present) and be comfortable with basic virtual machine concepts. If not, come back when you’re ready. Fedora 20 was supposed to include Vagrant, but I don’t think this happened. In the meantime, I installed the latest x86_64 RPM from the Vagrant download page. EDIT: Please use version 1.3.5 only! The 1.4 series breaks compatibility with a lot of the necessary plugins. You might have success with different versions, but I have not tested them yet. The virsh and virt-manager tools are especially helpful additions. Install those too. Vagrant has a concept of default “boxes”. These are pre-built images that you download, and use as base images for the virtual machines that you’ll be building. Unfortunately, they are hypervisor specific, and the most commonly available images have been built for Virtualbox. Yuck! To get around this limitation, there is an easy solution. You’ll have to replace the precise32 name in the below Vagrantfile with centos-6. This plugin can also convert to KVM friendly boxes. line in your ~/.bashrc file. config.vm.box = "precise32"			# choose your own! :ip => "192.168.142.101",	# choose your own! :ip => "192.168.142.102",	# choose your own! # Enable provisioning with Puppet. You might want to use the agent! As a result, each machine will have two IP addresses. I won’t go into further details here, because this information is well documented. and then shouldn’t experience any more prompts when you try to manage libvirt! You’ll obviously want to replace the james string with whatever user account you’re using. For more information on the format of this file, and to learn other ways to do this read the pkla documentation. 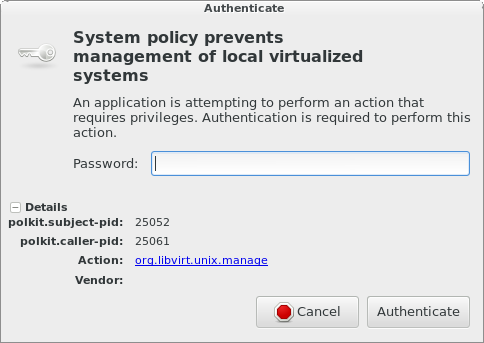 If you want to avoid PolicyKit, you can connect to libvirtd over SSH, however I don’t have sshd running on my laptop, and I wanted to connect directly. The default vagrant-libvirt example demonstrates this method. Provisioning machines without configuration management wouldn’t be very useful. Thankfully, Vagrant integrates nicely with Puppet. The documentation on this is fairly straightforward, so I won’t cover this part. I show a simple Puppet deployment in my Vagrantfile above, but a more complex setup involving puppet agent and puppetmasterd is possible too. Hopefully this makes it easier for you to hack in GNU/Linux land. I look forward to seeing this supported natively in Fedora, but until then, hopefully I’ve helped out with the heavy lifting.